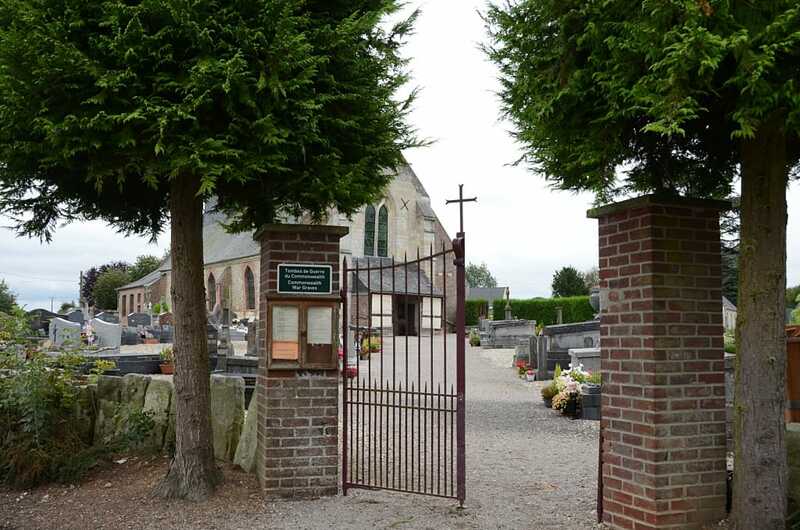 Romescamps is a village and commune 23 miles (36 kilometres) north-west of Beauvais, and 2 miles (4 kilometres) north-east of Abancourt. The graves of 7 airmen, 6 belonging to the Royal Air Force and I to the Royal Canadian Air Force, are near the middle of the north wall of the churchyard. 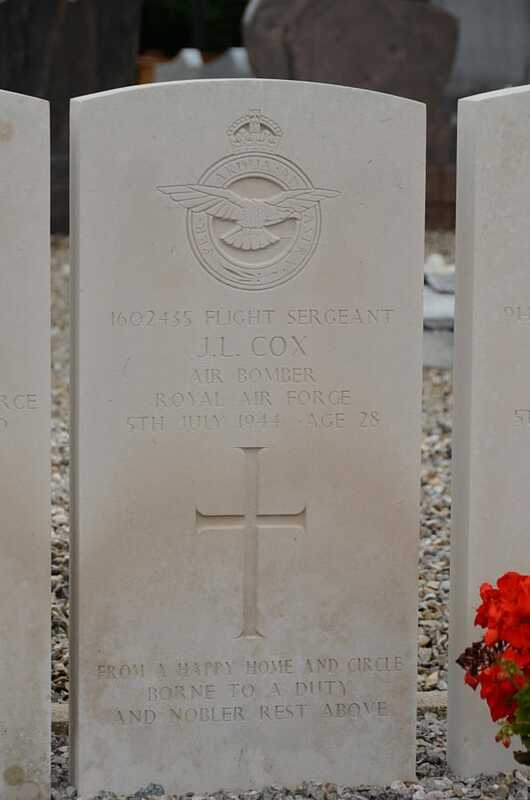 1602435 Flight Sergeant James Lawford Cox, Air Bomber in 49 Squadron, Royal Air Force Volunteer Reserve, died 5th July 1944, aged 28. Son of James Alexander and Lilian May Cox, of Romford, Essex. 173926 Flying Officer Harold Frederick Dod, Pilot in 49 Squadron, Royal Air Force Volunteer Reserve, died 5th July 1944. 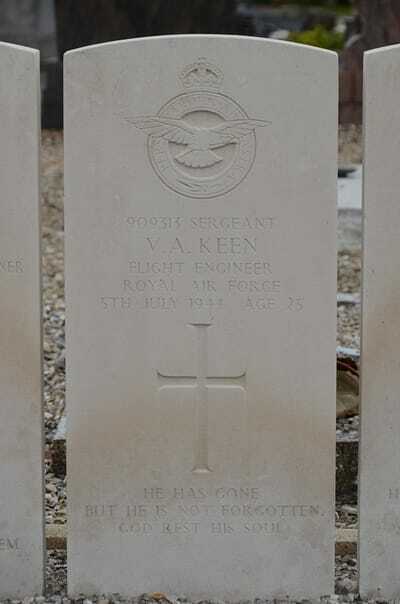 Husband of F. S. Dod, of Southall, Middlesex. 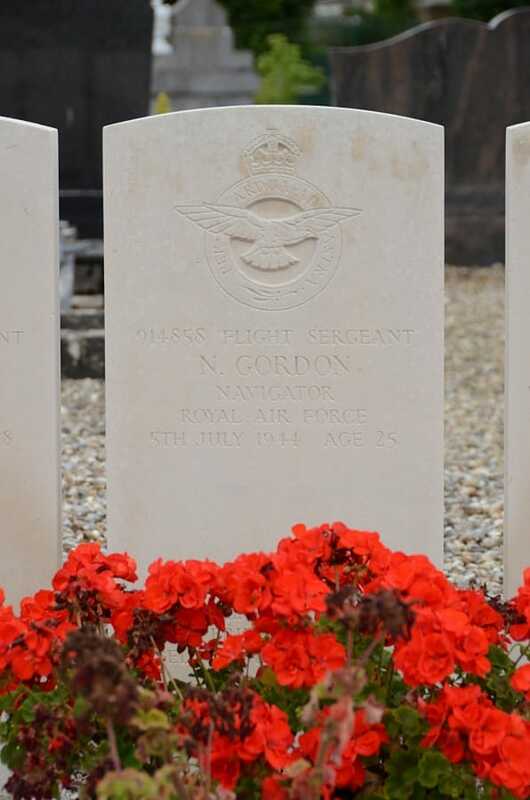 914858 Flight Sergeant Norman Gordon, Navigator in 49 Squadron, Royal Air Force Volunteer Reserve, died 5th July 1944, aged 25. Son of Edward and Cherrie Gordon, of Edgware, Middlesex; husband of Barbara Lambert Gordon, of Harrogate, Yorkshire. 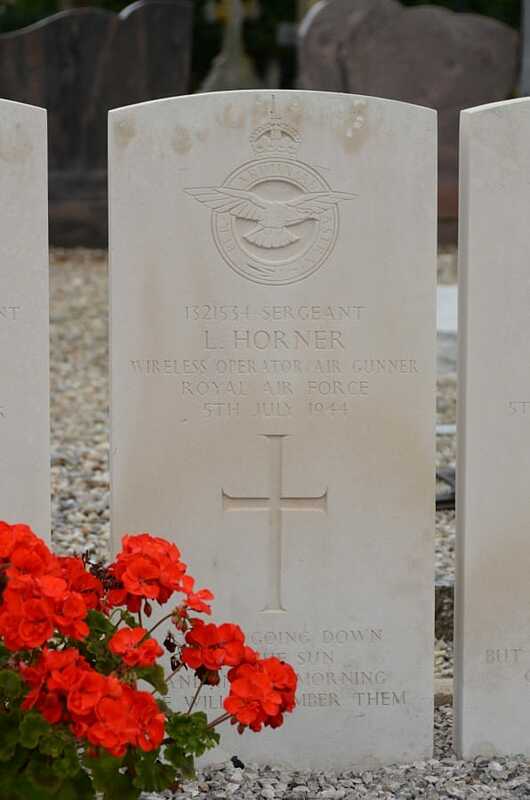 1321534 Sergeant Leon Horner, Wireless Operator/Air Gunner in 49 Squadron, Royal Air Force Volunteer Reserve, died 5th July 1944. 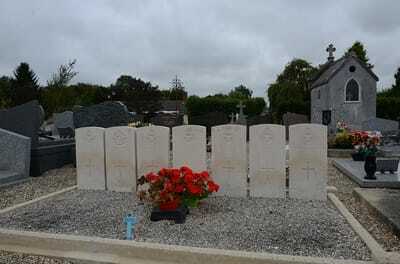 Son of Leon Horner, and of Ada Horner, of East Ham, Essex. 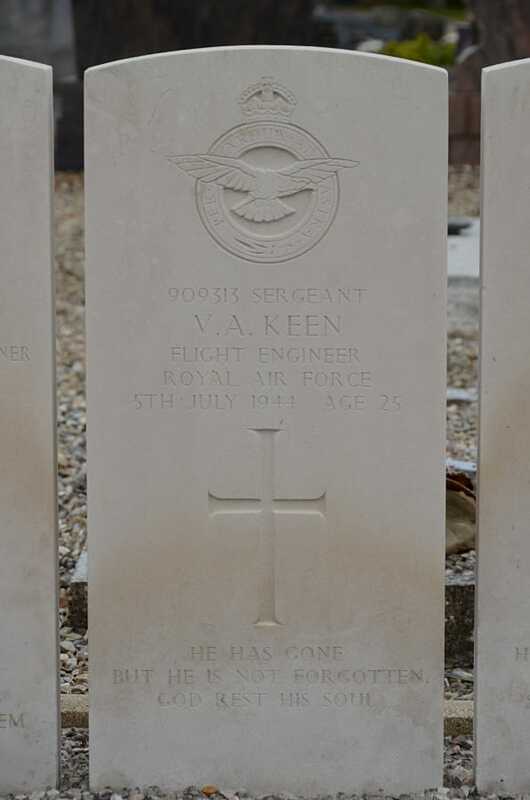 909313 Sergeant Victor Albert Keen, Flight Engineer in 49 Squadron, Royal Air Force Volunteer Reserve, die 5th July 1944, aged 25. 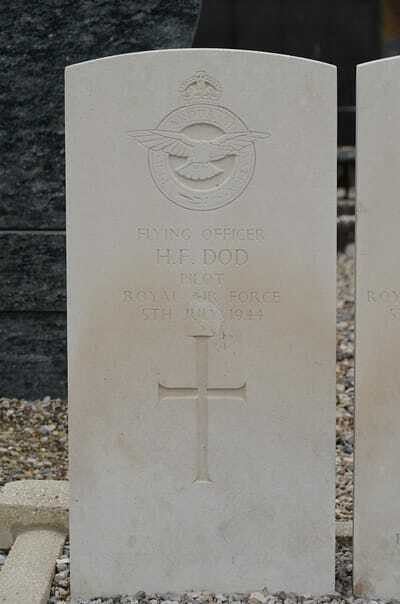 Son of Harry William and Margret Dodds Keen. 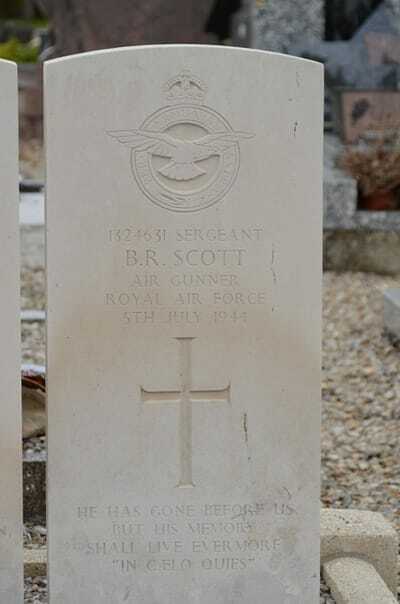 1324631 Sergeant Bruce Robert Scott, Air Gunner in 49 Squadron, Royal Air Force Volunteer Reserve, died 5th July 1944. Son of Alexander and Anna Scott, of North End, Portsmouth. J/87770 Pilot Officer James Robert Truscott, Air Gunner in 49 Squadron, Royal Canadian Air Force, died 5th July 1944, aged 20. 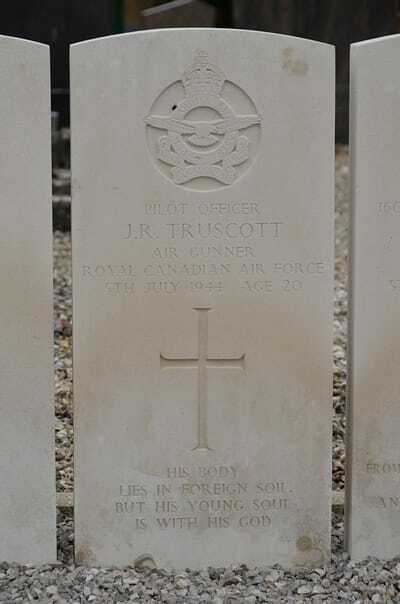 Son of James Stuart Truscott and Ivy Gladys Truscott, of Windsor, Ontario, Canada.